There are two conflicting ideologies on the source of empathy between a consumer and the creator. On the one hand, such individuals as Henry Jenkins in his work “Transmedia Storytelling” argues that the world of an experience should come first. For Jenkins, a well-developed world proves to be the most poignant source of connection with an audience as it can cross into multiple media. A world can reach through the barriers of games, or comics, or television and bring enthusiasts of each medium together because of their appreciation of one world. On the other hand, there is the approach delineated by Scott McCloud in The Vocabulary of Comics, which focuses on how the representation of characters can manipulate the connection between the audience and a work. 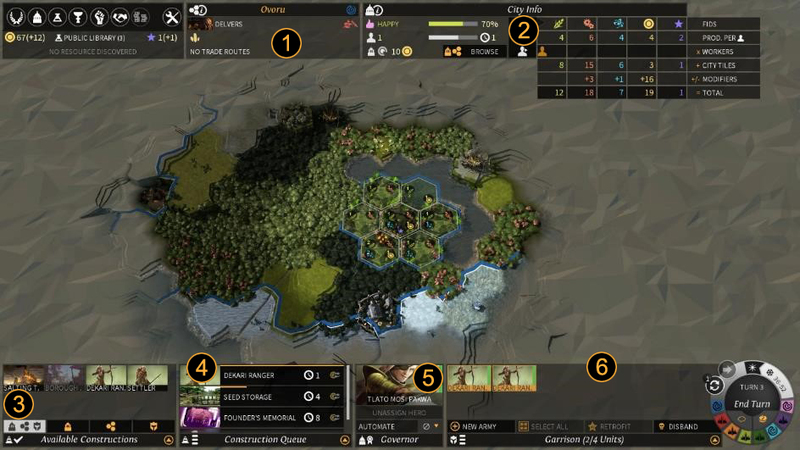 Both perspectives converge in the game Endless Legend, a computer game by Amplitude Studios which combines an intensely developed world with in-depth narratives and characters. 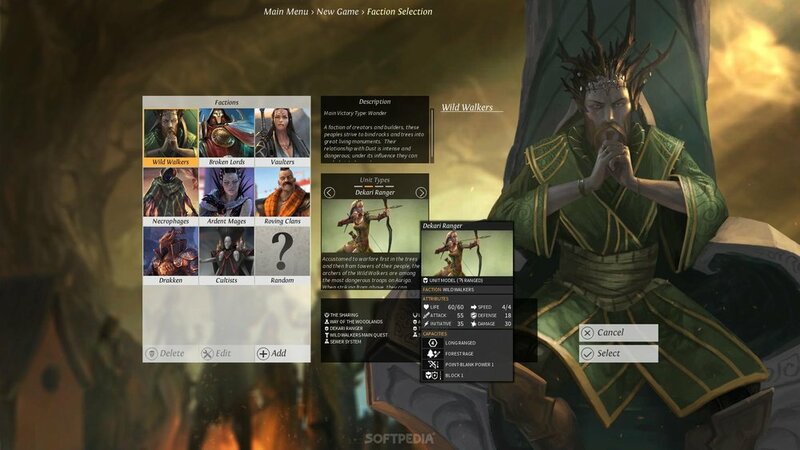 Faction Screen in Endless Legend. Endless Legend begins with a combination of characters and world building. When one first begins the game, the player is offered the opportunity to choose a faction. Each faction has a leader, specialty traits, and, most important, a history. Personally, it is the history with the specialty traits as a close second that help me determine with which faction I want to play. However, as shown in the figure below, the text depicting the history and traits are not the primary focus of the start screen. It is the leader, the character. From a “character first” or “character representation first” viewpoint, it seems as if the understanding from the creator’s end is that the player will respond most strongly to the visual representation of each faction. This tool of a using a central, visual figure to which the player can cling as a source of empathy is carried through to the actual game. Each faction has a “hero” character with which the player first explores the world. The factions are visually distinct, allowing the player to feel unique in their connection to the hero even in a world rife with detail. The hero unit-as-character is ultimately a case study in how the game uses an empathetic character to give an anchor to, and flesh out, an interesting and deeply developed world. The art in the game is detailed, with a combination of realism and abstraction. While the lighting, textures, and human character proportions do offer a more realistic representation, the game uses an abstract approach to model the way the world works, from territory to societal change. Maneuvering through the world is mechanical, as players achieve growth but are also limited by tiles. An example of such a relationship between growth and limitations is the component of per-tile growth in a city. The mechanism is an abstraction of real decisions and consequences national and municipal leaders must deal with. However, in the game, it is represented as a rate at which your territory will expand to a new tile. Playing the game is an exercise in absorbing vibrant, detailed art that represents abstracted ideas and systems. Based on Scott McCloud’s analysis of human representation in entertainment, in particular comics, Endless Legend’s art, which trends more towards realism, would serve to alienate players as the characters become more objectified. While there are realistic components in the game that pose a risk of alienating players, I believe that two abstractions balance the realism of the game: the first being a certain level of abstraction in the art itself (monsters, creatures, fantastical terrain) and the second being the abstraction in how the game presents the world. The world mechanics are an abstraction of our own world order. Just as an illustration can provide a symbolic representation of a human figure, so does Endless Legend provide symbolism that reflects our own global and national economic systems. Despite that the game has monsters and new creatures, the world does reflect our own well. There are both natural and societal obstacles to overcome. The representation of the game reflects and uses a more realistic representation. Most of the faction characters are humans (or humanoid) and the modelling of the game does not have a high level of abstraction to it. As such, Endless Legend shows the power of game mechanics and how the relationship between players and games through them shatters the boundaries that other genres experience. In Endless Legend, the game mechanics create a sense of ownership and empathy within the players. More precisely, the game mechanics built as abstractions of world systems players are already familiar with provide a deeper connection between players and the world of Endless Legend. However, Endless Legend takes a step further than other society building games in that it has strong characters and backstory for each faction. As you progress through the game, you are given quests that are intended to create an understanding of the history and conditions of the player’s faction. Endless Legend demonstrates that the rules laid out by Scott McCloud cannot be fully transferred to a medium in a purely visual sense, as you might expect to see in comics or animation. However, the game also posits that world building cannot exist apart from character development, as argued by Henry Jenkins. While the game is still relatively new and niche and so has yet to see a transmedia awakening, I predict that both the characters and the world will have equal footing in transmedia manifestations as they are intimately linked to one another.